The Waldorf-Astoria was born from a feud. As we explored in the discussion of New York’s Four Hundred, after the death of her father-in-law, Mrs. William B. Astor Jr (Caroline) declared herself “Mrs. Astor”. Her nephew, William Waldorf Astor, felt that his wife should be called simply “Mrs. Astor” since he was head of the senior branch of the Astor family. 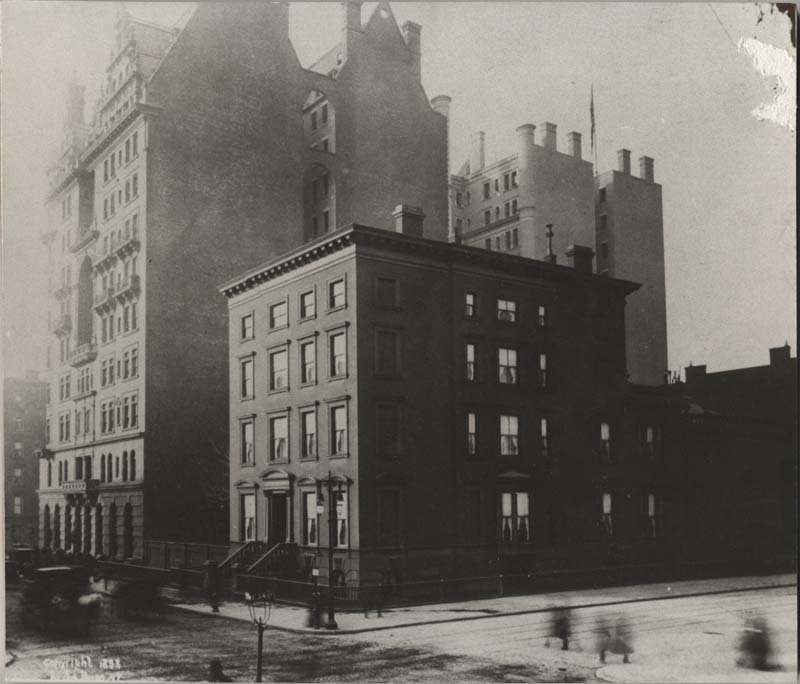 Caroline refused to budge and W. W. Astor exacted his revenge by tearing down his side of the connecting Astor brownstones to build the Waldorf Hotel (1893). This move was tantamount to throwing down the gauntlet to his aunt. W.W. Astor moved to England and watched with glee as the thousands of visitors to the hotel invaded his aunt’s staunchly-held privacy. Caroline eventually capitulated. Her move uptown conceded both to her nephew’s vengeful behavior and the social prominence of the Vanderbilt family, who in the early 1880s, built their massive Fifth Avenue mansions well above the streets the Mrs. Astor considered fashionable. John Jacob Astor IV (yes, the one who went down on the Titanic) was now titular head of the family after W.W. Astor’s defection to England (who became a British citizen). J.J. Astor decided to build a hotel on the site of his mother’s former residence to accompany the Waldorf Hotel. Four years after the Waldorf Hotel opened its doors, the Astoria Hotel made its debut and the neighboring hotels soon became the Waldorf-Astoria. This double luxury hotel was an immediate sensation and outshone any other built before, with its forty public rooms and 1300 guest rooms. 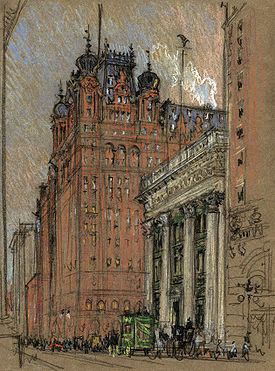 The Waldorf-Astoria also opened its the doors for public dinners and dining in a way Sherry’s and Delmonico’s had been unable to do as mere restaurants. Known colloquially as “the Hyphen,” the Waldorf-Astoria was the place to see and be seen between noon and the early hours of the morning. 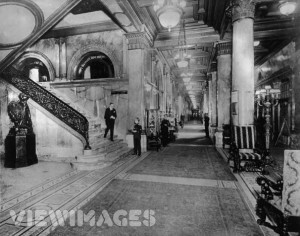 At the 34th Street entrance, a wide, three-hundred foot amber-marble corridor where guests could relax on the luxurious chairs and sofas, became known as “Peacock Alley.” The primary restaurants of both hotels featured wall-to-wall mirrors, allowing easy viewing of other diners while one supped. 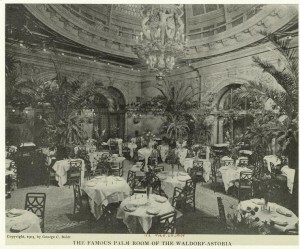 So coveted were seats in the Palm Room that tables were frequently engaged weeks in advance, and at seven o’clock, the velvet rope placed across the entrance signaled that those without reservations would have to dine at the less prestigious Empire and Rose Rooms overlooking Fifth Avenue. Prior to the 1890s, high society ate at home or in an exclusive restaurant like Sherry’s, but as the smart set began to “dine out,” hotels such as the Waldorf-Astoria (and later, the Ritz-Carlton, and the Hotel Regis) quickly adapted to this new form of social amusement. Now there was a great emphasis on eating well and people “thought out their meals and hired foreign chefs more extensively than before. 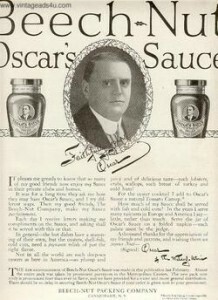 Americans began to explore menus with French names more confidently and found that the dishes they signified had as exotic a flavor as the cooks who created them.” Oscar Tschirky, better known as “Oscar of the Waldorf,” guided this new movement. Born in Switzerland, Tschirky emigrated to America in the 1880s and set about changing the way 19th century society ate one step at a time. He advanced quickly in the restaurant world and by 1891, had become maître d’hôtel of Delmonico’s Restaurant. His fame spread throughout New York City and he then went with Hoffman’s to take charge of its famous Down-Town Restaurant, where he remained until he was hired by George C. Boldt to take charge of the Waldorf’s restaurant. Not simply a place for after-supper dining or afternoon tea and lunches, the Waldorf-Astoria was also a favorite hotspot for gentlemen. The Men’s Cafe, a lofty, spacious hall paneled in dark wood, was liberally provided with tables and arm chairs, and the four-sided mahogany bar was the magnet for such financial luminaries as J.P. Morgan, Henry Clay Frick and “Bet-A-Million” Gates. The bar dominated the room where eight bartenders slung out drinks of nearly five hundred varieties, and not far from it was the “free lunch” table where habitués could snack on Virginia ham, Vermont turkey, various hot delicacies in casseroles, and an assorted cold buffet. The concept of the “free lunch” was new, and one that paid off for bars since much of the food offered for free was of a salty, dry nature that required a drink. A man who was liable to linger in the cafe snacking on free food was likely to purchase a surfeit of cool, refreshing liquids to quench his thirst. Also? Astoria was the wife of the Muppet named Waldorf. Lol! Waldorf and Statler are my favorite Muppet characters! was not aware the Astoria has so rich history. I though this Astoria is the original one. Thanks for the great article.